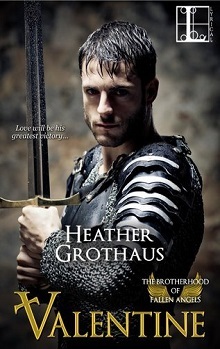 What I expected was a slightly darker medieval era story with a touch of romance and drama. Valentine is soldier of the Crusades, and is desperately seeking to avenge his reputation. Mary is a young woman betrothed to him, but running without chaperone or sense to find her man. Mary was, in short, a brat. Spoiled, clueless and not particularly likable. Valentine had a bit more polish – but I didn’t buy him as a crusader, or one particularly interested in more than an ‘on the road’ romance. More than once did I find language, dialogue and description lacking – there wasn’t a clear sense of adventure or danger for Valentine and the relationship – as it was defined didn’t make sense as a romance. Certainly not a clear direction from start to finish for me, so I’m leaving rather disappointed.